When you're in the field, you never know what you'll come across. 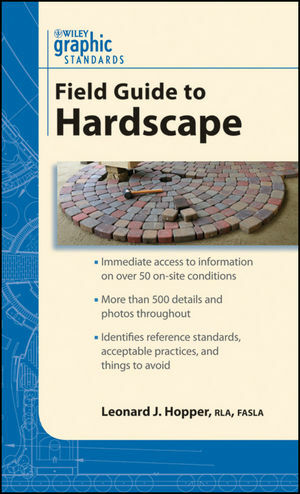 The Graphic Standards Field Guide to Hardscape gives you fast access to the practical information you need when you're on-site and under pressure. Presented in a highly visual and easily portable format, the Field Guide is organized to follow a logical project sequence from site evaluation of existing conditions through construction maintenance. Covering everything from assessing existing conditions, site work, bases and paving, site improvements, and materials, this handy companion conveys the most common answers that landscape architects need in the real world when visiting a construction site, and meeting with architects and engineers or clients and contractors. 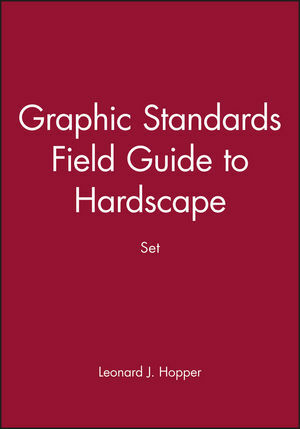 The Graphic Standards Field Guide to Hardscape is the ideal companion for the on-the-go landscape architect, design professional, inspector, facilities manager or anyone that is involved with site construction. Leonard J. Hopper, RLA, FASLA, is Senior Associate at Mark K. Morrison Landscape Architecture PC. He is also Editor-in-Chief of Landscape Architectural Graphic Standards and Landscape Architectural Graphic Standards, Student Edition and coauthor of Security and Site Design (all from Wiley). Currently a faculty member at the City College School of Architecture and Environmental Studies, Columbia University, and SUNY Farmingdale in New York, Mr. Hopper is a former president of the American Society of Landscape Architects and the Landscape Architecture Foundation, a technical advisor for the Sustainable Sites Initiative, and a frequent speaker at universities and conferences. Part II— Temporary Construction Installations. 2 Temporary Access Roads and Parking. 3 Temporary Barriers and Enclosures. Part III— Demolition and Site Clearing.